Travel is inspiring. It feeds your soul and breathes new energy into your life. It sparks creativity and broadens your horizons. Especially when you take in a little art during your vacation. Visiting a museum or gallery can be a great way to get a feel for a city’s culture and history. And we just happen to travel to some of the best travel destinations for art lovers! These thirteen cities are famous for their impeccable art scenes. Florence just might be the best city in the world for art lovers. Art is everywhere in the city, from public piazzas to hallowed galleries. Don’t miss these spots when you visit. Until 1873 the renowned David by Michelangelo resided outdoors in the Palazzo della Signoria. It was moved to the Galleria dell’Accademia and later replaced with a smaller replica – however, we recommend paying a visit to the real deal. David is the main draw at the Accademia, but you’ll find other sculptures by Michelangelo and a collection of Renaissance paintings there as well. The Uffizi is a top art museum, boasting the world’s greatest collection of Italian Renaissance art. It’s found adjacent to the faux-David and Palazzo della Signoria, near the Arno River. This open-air museum near the Uffizi was built in the 14th century and showcases antique and Renaissance sculptures. The best part about this museum? It’s free and needs no reservations! 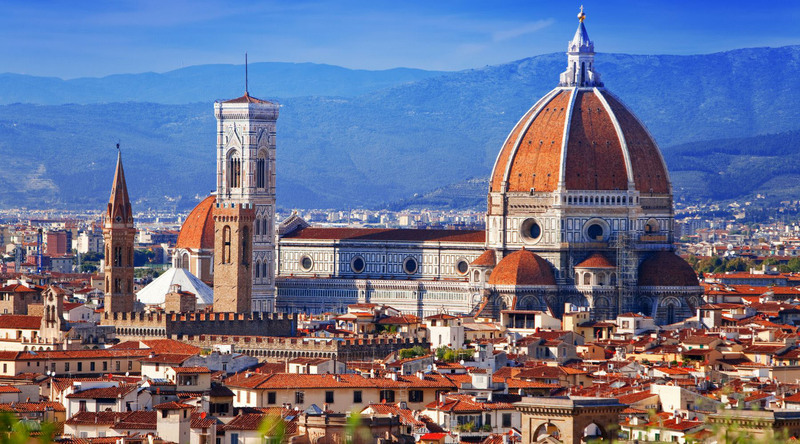 Browse upcoming voyages to Livorno (Florence). Denmark’s second-largest city is also a vibrant cultural hub. In fact, the city was named the European Capital of Culture for 2017. Roam the city’s charming cobblestone streets and you’ll see plenty of small art galleries worth browsing. ARoS Århus Art Museum is one of the largest art museums in Northern Europe. Established in 1859, it reopened in a modern 10-story building in 2004. Visit to enjoy the museum’s large art collection and special exhibitions of Danish artists. You can’t miss the museum’s iconic rainbow panorama on the roof and don’t skip the basement, where The 9 Spaces gallery evokes Dante’s The Divine Comedy. If you consider food to be a form of art (we certainly do), you’ll love Århus. The city is home to three Michelin-starred restaurants: Restaurant SUBSTANS, Restaurant Frederikshøj, and Restaurant Gastromé. Cruise to Århus in 2018. Singapore has so much to offer, including several must-see museums and galleries. This gallery is housed in historic City Hall and Old Supreme Court buildings, connected by a stunning glass and metal canopy. It boasts an extensive collection of Singaporean and Southeast Asian art from the 19th century to modern day. This museum is dedicated to the culture of Peranakans, descendants of Straits Born Chinese. Visitors will be wowed by the ceremonial costumes, intricate crafts, carved wedding beads, and other items displayed here. Browse upcoming voyages to Singapore. This Basque city is most famous for one thing: the Frank Gehry–designed Guggenheim Museum Bilbao, which opened in 1997. The museum revitalized the city and is its main draw for tourists. The shimmering, swirling titanium structure is iconic. The building’s exterior is almost more exciting than its contents. Art is all around, beginning with Daniel Buren’s Arcos Rojos sculpture arching over the La Salve Bridge. There is Jeff Koons’ Puppy, a 12-meter-tall Highland Terrier made up of thousands of begonias. Koons is also responsible for Tulips, a shining, multicolored, oversized bouquet. In stark contrast to a floral puppy is Louise Bourgeois' Maman, a 9-meter-tall skeletal spider sculpture of bronze, marble, and stainless steel. In the central atrium, you’ll find a simple pool of water and Fuyiko Nakaya’s unique Fog Sculpture - Nakaya is the first artist to work with fog as a medium. And this is just outside the museum’s walls. The Guggenheim’s interior is vast, and home to an assortment of incredible permanent and temporary exhibitions. Cruise to Bilbao in 2017 or 2018. Known as “Australia’s Cultural Capital”, Melbourne is by far Australia’s artsiest city. Begin by exploring by foot or tram to take in the city’s incredible public art. Many walls, like the ones on Union Lane, are decorated with vibrant street art, and impressive sculptures can be found across the city. If you have time for only one museum, call on the Ian Potter Centre: NGV, one of the National Gallery of Victoria’s two sites. The National Gallery of Victoria is Australia’s oldest, largest, and most visited art museum. The Ian Potter Centre showcases Australian art and has an impressive collection of paintings, photography, sculpture, fashion, and more. Its Aboriginal art exhibition is particularly stunning, making the Ian Potter Centre one of Melbourne’s top attractions. One of Melbourne’s newer museums is the Monash University Museum of Art, or MUMA. This museum was opened in 2010 and features both international and Australian contemporary art. At Melbourne University, you’ll find the Ian Potter Museum of Art. This museum’s collection of Australian art spans from antiquities to contemporary. The mix of classic architecture and modern sculpture makes walking around the campus a delight – grab a Sculpture on Campus map while you’re at the museum. Browse upcoming voyages to Melbourne. Another of Paris’s famous art museums is the Musée d'Orsay. Housed in a beautiful former railway station in the city’s 7th arrondissement, the Musée d'Orsay features France’s national collection of art from the impressionist, postimpressionist, and art nouveau periods. Visitors will see works by Monet, Manet, Renoir, Cézanne, Van Gogh, and more. St. Petersburg should be on the travel bucket list of any art lover. In fact, the city is home to so much incredible art that one can visit again and again, always finding something new to discover. St. Petersburg’s State Hermitage Museum is one of the oldest and largest museums in the world. The museum is housed the stunning Winter Palace and five additional historic buildings along the Palace Embankment. Only a fraction of its three million items are permanently on display. There are 360 rooms to explore, so it’s best to plan ahead and prioritize before your visit. Perhaps the second-most famous museum in the city is the Russian Museum, housed in the gorgeous Mikhailovsky Palace. This is where you’ll find the largest collection of Russian fine art. For something a little different, consider visiting the Fabergé Museum in the heart of St. Petersburg. The museum’s collection of over 4,000 works includes paintings, porcelain, gold and silver, but the real draw is its fifteen Fabergé eggs. Nine of these are Imperial Easter eggs, made for the last two Romanov Tsars. Then, of course, there are the many incredible palaces and cathedrals of St. Petersburg. We told you there’s always something new to discover! Browse upcoming voyages to St. Petersburg. London is home to many incredible art museums and galleries, and they're free to visit. For brevity’s sake, we’ve narrowed it down to just five to highlight here. The National Gallery was established in 1824 to showcase 38 paintings. Today it boasts over 2,300 works of art. The museum is located in Trafalgar Square, so it’s a breeze to stop in briefly while sightseeing or enjoy a longer visit with the aid of an audio guide. The V&A showcases applied arts from around the world – that includes everything from sculpture, ceramics, and glasswork to jewelry, furniture, and fashion. There are 150 galleries on seven floors, so it’s wise to select your top priorities before visiting. The Tate Britain boasts the largest collection of British art in the world, ranging from 1500 to modern times. It’s perhaps most famous for the Clore Gallery, which displays the world’s largest collection of J. M. W. Turner’s works. Britain’s national museum of worldwide modern and contemporary art is one of London’s most popular museums. It’s located in a former power station, and the vast Turbine Hall (which once stored electricity generators) is used to awe-inspiring effect by displaying specially commissioned large-scale works. Here’s your opportunity to come face-to-face with the people who have shaped Britain, from royalty and politicians to musicians and actors. In addition to paintings, subjects are captured through video, photography, sculpture, and more. Explore London's museums and galleries to your heart's content when our 2018 World Journey concludes there. Vietnam may be best known for food, but its burgeoning art scene is another compelling reason to visit. Explore contemporary Vietnamese art at Hanoi's galleries like Green Palm Gallery, Nguyen Art Gallery and Apricot Gallery. Gain a deeper understanding of Vietnamese culture and heritage by visiting Hanoi’s Fine Arts Museum. The silk paintings, sculptures, and lacquer works displayed here are simply stunning. The Vietnamese Women’s Museum offers more insight into local history and culture, showcasing the evolving role of women in Vietnamese society. Photography, propaganda posters, and costume displays are of particular interest. Finally, don’t miss strolling Hanoi Ceramic Road. This 4km path along the Song Hong Dyke features the world’s largest ceramic mosaic mural, installed to celebrate Hanoi’s 1000th birthday celebration in 2010. Browse upcoming voyages to Halong Bay (Hanoi). When we think of art and Amsterdam, one place immediately comes to mind: Rijksmuseum. This Dutch National museum displays 8,000 items from a collection of over one million pieces. Highlights include works by Rembrandt, Vermeer, and Van Gogh. It's surrounded by a stunning formal garden, shown here on their Instagram account. Speaking of Vincent van Gogh, his works are further showcased in the nearby Van Gogh Museum. Here, you can browse hundreds of his paintings, sketches, and letters. Amsterdam’s Museums of the Canals are a series of small museums housed in canal mansions. Visit Museum Van Loon for a look at how a rich and powerful 17th-century family lived. Then stop in at FOAM (Fotografiemuseum Amsterdam) to see its impressive photography exhibits. Museum-hoppers in Amsterdam should consider an I Amsterdam City Card, which provides free access to many of the city’s museums and attractions, among other things. Browse upcoming voyages to Amsterdam. Scotland’s national art gallery is located on The Mound, an artificial hill in the heart of Edinburgh. It houses Scottish and international fine art from the Renaissance period to the beginning of the 20th century. Like London’s portrait gallery, this museum features portraits of those who’ve shaped the city’s rich history – from Robert Burns to Sean Connery. This gallery showcases contemporary art dating from about 1900 to present day. It’s housed in two gorgeous neoclassical buildings known as Modern One and Modern Two. Visit Modern One to see the main collection, featuring works by Matisse and Picasso as well as modern Scottish art. Visit Modern Two to view the museum’s renowned Surrealism collection, which includes works by Dali. Contemporary art fans should also call on The Fruitmarket Gallery, one of the city’s most important art spaces. The gallery hosts exhibitions of contemporary art by high profile Scottish and international artists. There’s also a café and bookshop to enjoy. Browse upcoming voyages to Edinburgh. Art is everywhere in Rome. You can spend a day exploring the sprawling Vatican Museums, make an appointment to visit intimate Borghese Gallery, or simply stroll the streets admiring the many obelisks, fountains, and statues to be seen. The Vatican Museums is one of the largest museums in the world, with 54 galleries. It’s most famous for the incredible Sistine Chapel, as well as the Raphael Rooms, the gallery of maps, the Gregorian Egyptian Museum, the gallery of statues, and the Papal Throne. And, of course, the Vatican’s Saint Peter’s Basilica can be considered a work of art in and of itself. Rome’s Borghese Gallery limits visitors to two-hour intervals, making advance booking a must. However, it’s worth it for art lovers visiting Rome. The first level features sculptures, mosaics, and frescoes, while the second level is devoted to paintings. Perhaps most famous in the collection is Bernini’s sculpture of Daphne and Apollo. Rome has a long and storied history, yet the city has also gained an appreciation for modern art. Opened in 2010, MAXXI is the city’s first museum devoted entirely to the art of today. The building, designed by renowned architect Zaha Hadid, is as modern and impressive as the museum’s contents. Browse upcoming voyages to Rome. This gallery is housed in a former train station and features the large collection of Berlin entrepreneur Dr. Erich Marx, including Andy Warhol’s Mao. The National Gallery also has a collection here of works from 1960 to modern day. This gallery promotes young, unknown contemporary artists. And after all, travel isn’t just about seeing famous works from the greats – discovering new art can be even more exciting. Photography buffs must visit this gallery, which highlights the work of both relatively unknown and world-renowned photographers. It recently moved into Berlin’s historic Amerika Haus building. This gallery showcases the personal collection of Thomas Olbricht, one of Europe’s most esteemed collectors. The collection includes works of a variety of mediums and periods that are thematically dark. Don’t miss this gallery, which features new exhibitions and a permanent collection of works by Berlin artists from 1870 to today. It’s a fascinating look at Berlin’s tumultuous history through art. Browse upcoming cruises to Warnemunde (Berlin). What city impressed you with its inspiring art? Comment below with your recommendations.